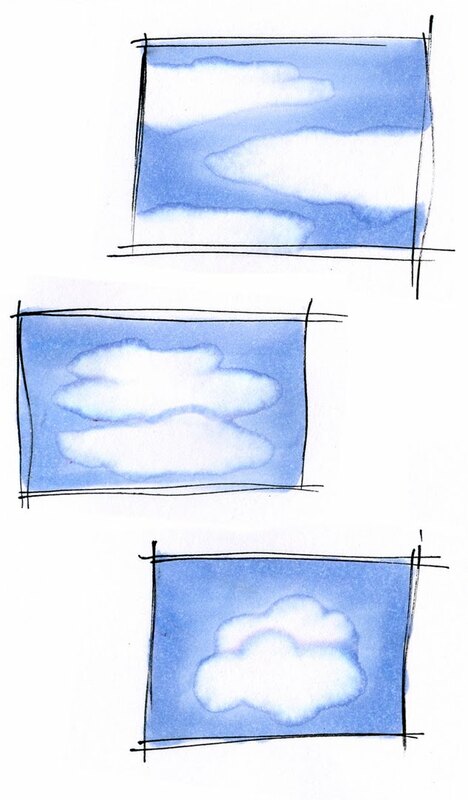 Yesterday I promised I'd show you a quick tutorial for coloring clouds. This is an easy technique that ends up looking really cool and very unique. I hope you give it a try. Remember, this effect only works on absorbent papers, not coated papers. It's always tricky to color something white with Copics, as you have to leave the paper white. 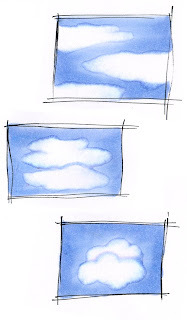 Today's tutorial is super easy, and gives you a bit of flexibility with your sky designs, especially if you don't have an airbrush to mask off pretty, puffy clouds. First, start by lightly feathering a pale blue into your sky (B41 in this case). 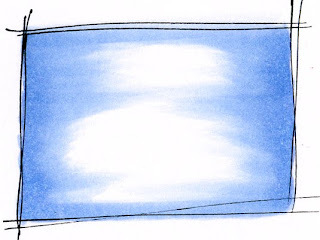 Be sure to leave some white areas where the blue feathers in, as these will be your clouds. Try to keep the bottom of the area parallel with the horizon, as it will look more believable that way. It's better if they are slightly irregular shaped. 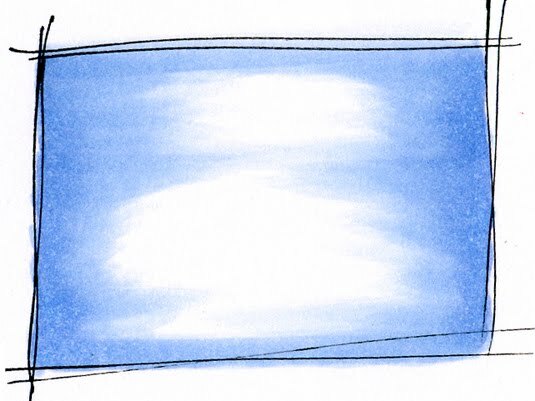 Make sure the rest of the blue area is streak free, which may take a few light layers of color. Next, go in from the middle of the white area with your colorless blender. Push the color from the middle of the white, out into the blue. Follow the natural streaks left in your work to create the irregular edges. How far out you push the color is up to you, but the more you push it out, the darker your edges will be. This is a good time to experiment and try different effects or cloud shapes. Try not to stop pushing until you are done with the whole shape, otherwise, you may get strange edges. It helps if your blender pen is really juicy and has been recently refilled. 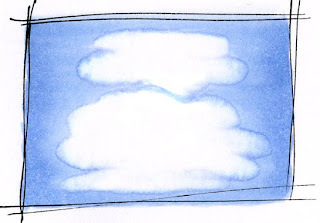 When you are done, your clouds should look something like this. 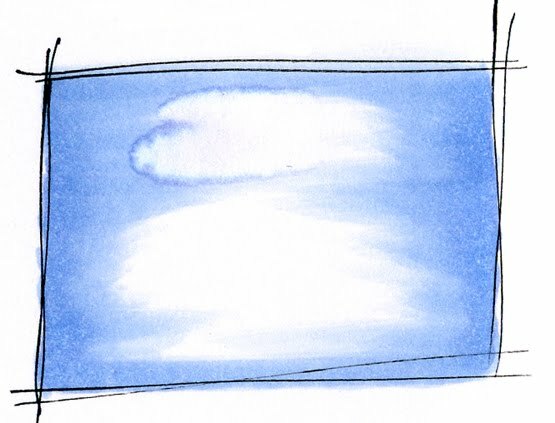 If you still see too much stray blue inside the cloud (like on the right edge of the bottom cloud in this diagram), you can always go back after the cloud is dry and push the color out again. If you try to fix it while the cloud is still wet then it won't do much. Here are some other fun variations on the same effect. Each time the shapes are different, so play around until you get a look you like. 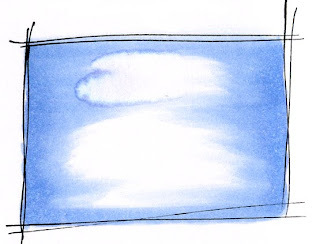 The bottom illustrations with a pair of clouds were made a little differently. First, the whole white area was blended out. 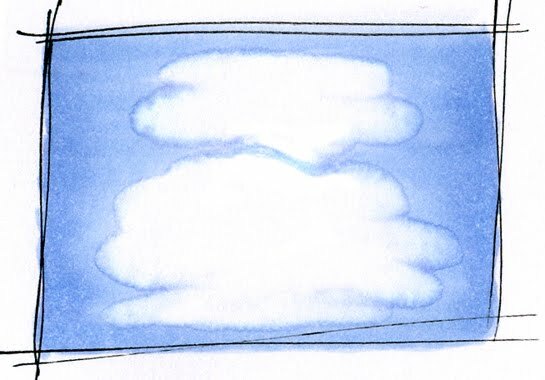 Then, while the middle of the clouds were still wet from blender, I took the sky marker and drew in the puffy top of the bottom cloud. Because the base was wet, the line immediately became soft and fuzzy, just like the rest of the edges. If you want to add a bit of color to the clouds, add it while the area is wet. Try adding some pale gray around the bottoms for a darker, ominous sky, or hints of pink or yellow for a cheery, whimsical effect. The final image today of Easter Island is actually one I drew for the Shadows & Shading book. 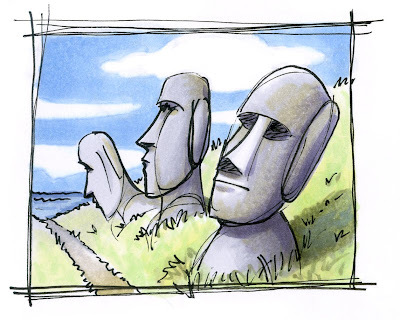 I could not run a marker coloring tutorial in the book on this technique, since I was using this illustration to explain a different concept. I can't remember which colors I used, but you can see that the clouds look convincing. I hope you have a great weekend and have a chance to color! I have been following your site for some time and I have learned so much. 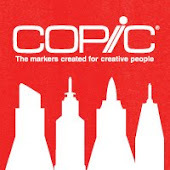 Thank you for all your wonderful posts on coloring with Copic markers. Without your site I would be lost. Great tutorial!! Thank you Marianne!! I am relatively new to your site but I can see I will be following it more closely in the future. 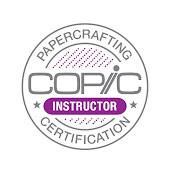 Thank you for you awesome tutorials. Thank you for another helpful lesson. 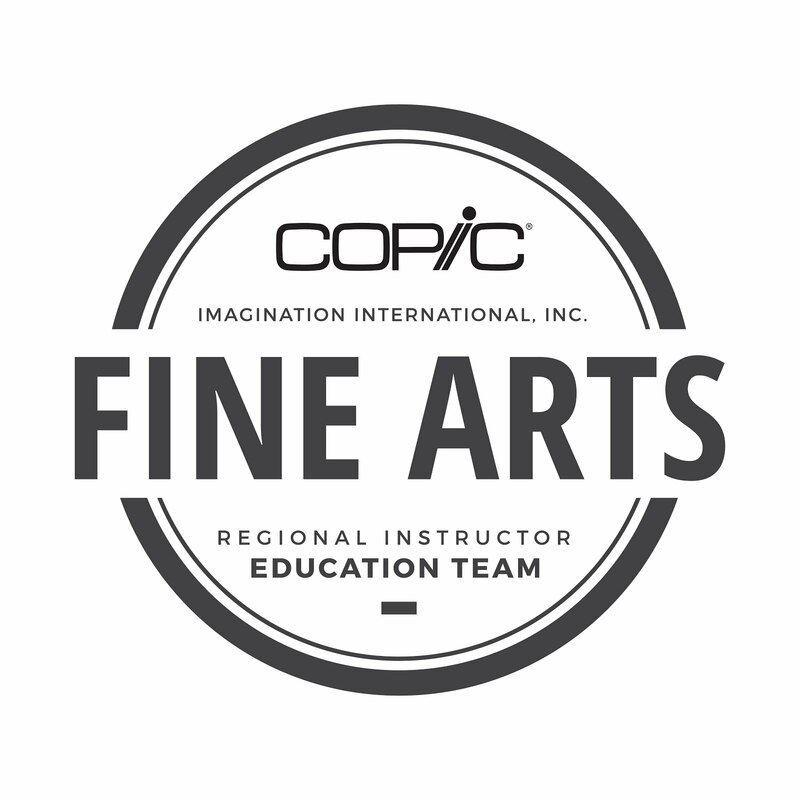 It is always fun to try what you have taught us. Thanks, this is a HUGE help. I have a hard time with skies. Would you consider doing a toot on night skies? Excellent post. Than you very much!